The cats (the female cats) of the residence’s ground shared another thing, their fudoki, which is self and soul and home and shrine, all in one to a cat. The fudoki is the chronicle of the females who have claimed a place, a river of cats that starts with the first to come to that place, and ends with oneself—when one grows experienced enough to have a tale to tell. It is also the place itself, and the cat whose story it is, and the immaterial shrine in which the household is honored. Set in eleventh-century Japan, Fudoki tells two stories: one is the story of the princess Harueme, daughter and half-sister and aunt and great-aunt of emperors. She is old and dying—not of age, but of a pressure “deep in her chest”. To pass the time until she has to leave court, so she might not soil its purity with her death, she writes the second of our stories, a monogatari tale, in several notebooks. This second story is the story of a tortoiseshell cat who loses her fudoki when her whole family is killed in a fire. She becomes a traveller, and is eventually transformed into a woman by unknown powers: she becomes Kagaya-hime, a powerful warrior, and in her long journey meets a kami (spirit of the road) and men who are half-foxes. At first, we are mostly told the story of the tortoiseshell cat, but as the book progresses it begins to focus more and more on Harueme’s life. This is not at all a bad thing: I loved Harueme, and her story was just as fascinating as the woman-cat’s. The stories also become more and more linked as the book progresses. Harueme is the author of the second tale, and as you discover more about her life, you begin to realize why she is writing the story she’s writing. Harueme’s story (and, in a roundabout way, perhaps also Kagaya-hime’s) is about what it is to be a woman and to be confined. Harueme’s life is a life of luxury and comfort, but it’s also a life of restriction: as an imperial princess, she is trapped, both in the physical sense and in the sense of having to live the life that was chosen for her. Her one act of rebellion comes at a price, and the price would have been much higher if it wasn’t for the quiet understanding and sympathy of her half-brother the Emperor. But Haraume’s court life is claustrophobic, and her desire for freedom is piercing. At one point, when talking about her lover Dōmei, a man from the North, she says that perhaps most of all she loved what his eyes saw. Tales and memories, however inaccurate, are all we have. The things I have owned, the people I have loved—these are all just ink in notebooks that my mind stores in trunks and takes out when it is bored or lonely. It is necessary to keep track of things, the third assistant comptroller of grains said. It is the recording of things, in our memories of nowhere else, that makes them real. My fudoki is precisely as long as my life has been. Without my fudoki I am nothing, because it and I are the same. 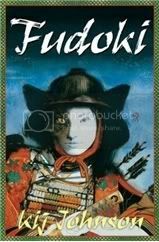 Fudoki is a lovely book, and I’m not sure if I’m managing to get across just how much I loved it. I got it a while ago, after falling in love with one of Kij Johnson’s short stories. Then last week I decided to read it at last, because The Love We Share Without Knowing and the manga I had been reading had left me in the mood for stories inspired by Japanese folklore. With Fudoki I got my fix, and I got more than that too. Th narrator’s voice is a big part of the reason why I loved it. I loved the princess’ subtle, quiet, reflective tone. I loved her wisdom and her insight; her anger and her fear. I loved all the restrained but genuinely touching moments. Life does not stop because of tragedy—but it can be gutted, left light and hollow as a winter gourd. We ascribe meanings because it is our nature to do so. The Tōkaidō means mystery and wonders and adventure. We can no more see a thing without searching for a meaning than we can see a snag in a robe without pulling on the loose thread. A child (or a cat) is not awed by the same wonders that an adult is, because everything is equally new and therefore wondrous. My nurse (and the adult I became) sees or imagines a comet and is struck by the beauty of it. A child has not seen so much that she knows that ice on the trees is common, and a comet rare and therefore precious. It is only age that tells us what is precious, what is new. And another change: I passed through a thousand thousand days, and each was made up of hours and moments; but they might as well have been a single day, for they are all past. Yesterday I was that girl chasing frogs (unsuccessfully, I add, and just as well: frogs are better left an unattained goal). And today I am very old. And tomorrow I will die. Is this any less strange, any less arbitrary and extreme, than that a cat becomes a woman? We try desperately to make sense of the world; to see the whys behind how things happen. We make up things that might help: sukuse, the law of cause and effect; perhaps even the gods. Perhaps even Buddha. But sometimes there is no why. I have often thought that we humans sort our lives and their experiences very strangely. We see everything as a tale, event following event, birth to death. These are the years I could have borne a child, that is the year I wore mourning for my father; this was the month that I fell in love, that the day I ran away. But time is very flexible, I think. I remember things from many years ago with crystal clarity—the brilliance of the red silk the Chinese traders brought to the capital when I was nineteen, the tiled skin of a snake I touched when I was six, the grass-bright smell of Dōmei’s breath—and they are clearer to me than the robes I wore yesterday. Today does not follow yesterday; now follows other nows. I have not lived seventy years. I have lived instead these things: the entwining of my days with a few men and woman I have loved; a longing to walk on unpaved roads; the collecting of vermin, and other unacceptable studies; quite a number of unpleasant or tedious duties performed; the making of ink; eating and elimination and hair-washing and tooth-dying. My seventy years are only the frame on which they hang. Poor little princess, poor me that was. I thought myself so clever, my mind stuffed with mouse-pelts and military theory. I despite poetry because it was useless (as it is; that is its charm, I am learning from Shigeko). But life is much more than utility, even supposing that familiarity with the patterns of moth’s wings can be considered practical. All that cleverness, and I did not realize how lonely I was. It is now on my TBR list. I've fallen in love just from your review! Ditto - just put a hold on it (or rather, will just as soon as my library card is unblocked, which will happen when I return my 11 overdue books. Ahem...). Can't go wrong with fantasy set in medieval Japan! This is just lovely. Another one to the TBR list. Ever since I found your blog it has been this way. All the books you read just sound sooo good. and such wonderful passages you posted, the writing is beautiful. This sounds great, but my library doesn't have it, unfortunately. I still don't know where you come up with some of the titles you find!! I've never heard of this one, but it sounds amazing!! I love this book and loved The Fox Woman even more. I'm sending you a little lve for all your kind words. Stop by and check it out. It never fails that every time you post to your blog I will find something truly unique and different. I know that I'm a better reader for it and I thank you!!! I've never heard of it, but it's definitely on my list now _ thank you! Wow, this sounds like a great read. Thanks for recommending! --> Life does not stop because of tragedy—but it can be gutted, left light and hollow as a winter gourd. Love your review! Thanks for the recommendation. I'm entering this into my wish list because I'm currently on a book ban. LOL. Nymeth, you have won an award over at my blog. You don't have to pass it on, I just wanted to show you how much I enjoy your blog. Debi: Her writing is just stunning, isn't it? And I love the cover art too! Eva M: Indeed you can't! Nely: I've been lucky to find a lot of amazing books the past month or so. I'm usually good at avoiding books I won't like, but I've been luckier than usual lately"
Naida: It is, isn't it? Stephanie: I think I first heard of this at the Endicott Studio blog. I got the best recommendations from them...how I wish the blog was still active. Melody: You're welcome! Hope you enjoy it. Maree, hope you enjoy it! Scrap Girl, thank you so much! Sounds fascinating! I'll be looking for it too. I've never heard of this book, and it's not likely one I would have picked up on my own. However, your review convinces me otherwise. The passages you share are truly beautiful. Thanks for such a wonderful review! I think you'll probably soon have some nice, shiny links to post. Wow, another great find from you nymeth. Off to stick it on the TBR list! I recently read a short story about the Kitsune (half-foxes) it was really interesting and different- just like this sounds! Lisa: I hope I do! This seems to be one of those books that aren't as appreciated as they deserve to be. Possibly because a lot of people who'd love it don't know it exists. Ladytink: Was it in the Windling/Datlow anthology you reviewed recently? I just love stories that use Japanese folklore. It just feels so...magical. Probably because we aren't exposed to it very often. Gosh this sounds good! I think that it would be a really good book for both my daughter and I, but for totally different reasons. I am so glad I visit this site, you are always reading something unusual and intriguing. I plan to order this one soon. Cats? Did you mention cats? Especially cats and folklore? That's all I needed to hear. This sounds like a beautiful and rich book--and I'm glad you shared why you picked it up because I was wondering throughout your review. I've never heard of it, but I'll be keeping it in mind for JLC3. Zibilee: Aw, thank you so much :D I hope you enjoy this! Rhinoa: lol! You won't regret it, you'll see. This is right up your alley. Wow! Thank you so much for your kind words. I am really glad you liked it. Kij, thank you for stopping by. And thank you for writing such amazing stories. Ill be getting myself a copy of The Fox Woman very soon. It's always fun to read what you write, about anyone.